The head of the Bulgarian Secret Service makes contact with MI6 and offers them a list of his agents. If genuine, this would be an incredible intelligence coup – but why would he betray his own people? Burnside’s initial thoughts are that it’s a setup (this is strengthened when one of the Sandbaggers is requested to make the rendezvous). Do the Bulgarians plan to lift the Sandbagger and exchange him for a prisoner held by the British? It’s not surprising that Peele, C and the Director of Intelligence, Edward Tyler (Peter Laird), are all keen. Burnside remains cautious though, as the last thing he wants to do is to lose another Sandbagger – especially as it’s exactly a year since he ordered the death of the previous Sandbagger Two, Laura Dickens. At All Costs is a seriously impressive series opener which continues the excellent run of episodes from the first series. The anniversary of Laura’s death is touched upon briefly by Willie Caine and Jeff Ross – we see both of them ask Burnside how he’s feeling. Characteristically, he tells them he’s not brooding on the past, but the prospect of another Sandbagger’s life hanging in the balance is the ultimate cruel irony on this particular day. Series one of The Sandbaggers should have provided ample evidence that this was never a series that took the easy way out or felt obliged to offer happy endings. A more conventional show would have seen the unfortunate Sandbagger Two, Tom Elliot (David Bearnes), rescued from Sofia (after the hand-over is blown) but the experienced viewer would by now expect a darker outcome. After killing several Sandbaggers in series one, would they really have the nerve to kill another right at the start of the second series? For Burnside, a man already haunted by the ghosts of the past, it would be one more crushing blow, especially when he was so dubious about the mission to begin with. D. Int and Peele didn’t share his qualms about sending Elliot though – if the material is genuine, then the risk would be worth it. Peele even mentions to Burnside that whilst he understands that Sandbagger Two is taking a risk, surely that’s what the Special Section is for? C takes a similar view, but he also adds another complication by revealing to Burnside that Whitehall plan to reduce the Special Section from three officers to two. Burnside is incensed and demands to know if C will fight on their behalf – he says he will, but the best way to maintain the current number of Sandbaggers is by demonstrating that they provide a worthwhile service. As C says, if Burnside continues to wrap them up in cotton wool it makes Whitehall’s plans all the easier to carry out. Confrontations between Burnside and Peele are always worth watching. 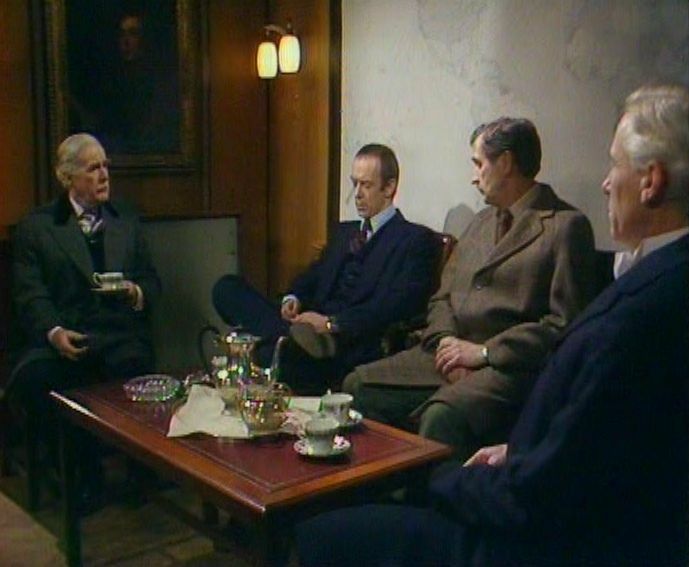 Early in the episode, Burnside tells him that if he’s not happy then he’ll abort the mission. Peele counters that he doesn’t have the authority. No, Burnside agrees, but he does have the means. The contrast between the two – Burnside (a man totally obsessed by his work, with seemingly no other life) and Peele (a fussy, by-the-book character, grumbling because he wants to leave for a game of bridge) – is never more apparent than here. But just when you think you’ve got a handle on the characters, they can still surprise you. After the meeting is blown, Tom Elliot is shot (although he manages to get away). Burnside wants to go to Bulgaria, along with Willie Caine and Jeff Ross, to get him out. Wellingham and C are dubious – Burnside is a desk man, not operations (and the intelligence he holds in his head is substantial. If he’s captured and interrogated, it would be a disaster). Everything we’ve seen so far suggests that Peele would support Wellingham and C – but instead he agrees with Burnside’s request to go. Once again, we see the Yorkshire environs doubling for a foreign country (in this case, Bulgaria). It’s suitably bleak and the grimy 16mm film makes it seem even more so. The scenes of a badly injured Tom Elliot, hiding in a very grotty room, simply adds to this bleakness. Willie tracks Tom down and finds him in a bad way – a bullet has grazed his spine and left him paralyzed. Burnside knows there’s nothing else to be done – Tom has to be put down and Burnside elects to do the job himself. He’s spared that task at least, since Tom’s already dead when he gets there (plus he manages to extract the intelligence from his lifeless body), but that’s a very small consolation. After ending the first series on such a dramatic note, you could be forgiven for thinking there would be some respite at the start of series two. At All Costs offers us no such pause for breath though and it’s hard to imagine a more uncompromising series opener.